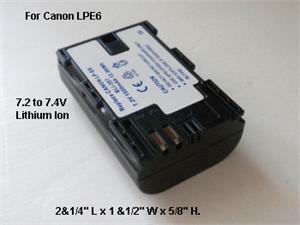 This battery is made by Empire Inc. fully compatible with your Canon camera and charger. The battery works for - EOS 5D Mark II , EOS 5D Mark III , EOS 7D , EOS 60D. 7.4V Lithium-ion battery , 1800 mAh capacity, with extended power to run your camera. The battery has the same dimensions as OEM LPE6 battery - 2&1/4" L x 1 &1/2" W x 5/8" H.